Wing Chun Kung Fu is a brand of kung fu that specializes in close range fighting and stresses using efficiency and form over raw speed and strength. Wing Chun focuses on maintaining an attack and defense based on understanding the centerline concept: an idea that most striking targets lie in this area and by disrupting centerline one can control another's balance. 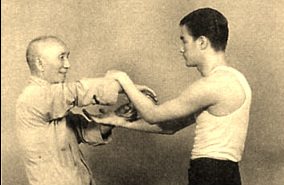 Wing Chun was brought to the international spotlight first by Bruce Lee, pictured to the left, in the tank top, with his Wing Chun Teacher Ip Man. More recently there has been a craze to make Ip Man Movies and the craze for Bruce Lee movies is still going strong 50 years later. What do I have to learn to master Wing Chun? Wing Chun is a great martial art to learn in modern times, being that it stresses efficiency, only has 3 hand forms, the Wooden Dummy and 2 weapons. Compared to other kinds of Kung Fu which may have 16 hand forms and 6 weapons, Wing Chun is extremely minimalist. The hand forms have a great built in progression for the student. The first form, Siu Nim Tao, teaches body posture, hand placement and relaxation. The second form, Chum Kiu, builds on the first by adding foot movement and angulation. The last form, Biu Jee, completes the open hand segment by taking the student through full body movements, adding springing energy to strikes and increasing the intensity of application. The wooden dummy, mook yang jong, puts all the information of the forms together and applies it to the wooden dummy for structure and positioning checks. The weapons - staff and butterfly knives are training for conditioning and application to modern weaponry is also taught. How is the Class Run? Our training stresses efficiency, relaxation, and close range engagements designed to equip students for the needs of our times. That's it - no special clubs to join, no equipment that you have to have that never gets used, just straight up costs! Wang Chung or Wing Chun? They are the Same right? We get asked this question a lot. 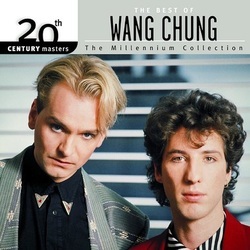 So let's make it clear - Wang Chung is an early '80's group that had 5 successful songs (for those under 30) "Everybody Have Fun Tonight", "Dance Hall Days" and "Let's Go" - Awesome songs, I like them, check them out. The band Wang Chung was a British New Wave band formed in 1980 - Wang Chung in Mandarin Chinese means yellow belt. As far as I researched (Wikipedia & Google) unfortunately no member of Wang Chung practices Wing Chun.